It’s remarkably powerful, it’s touching, it makes you laugh, it makes you cry, it’s intimate, it’s deeply personal and political at the same time. Based on autobiographical graphic novel by Alison Bechdel, the play Fun Home focuses on the theme of sexual identity. Through very powerful and familial context of father-daughter relationship, the musical explores the cost of living in the closet and the possibilities that open up, on coming out. 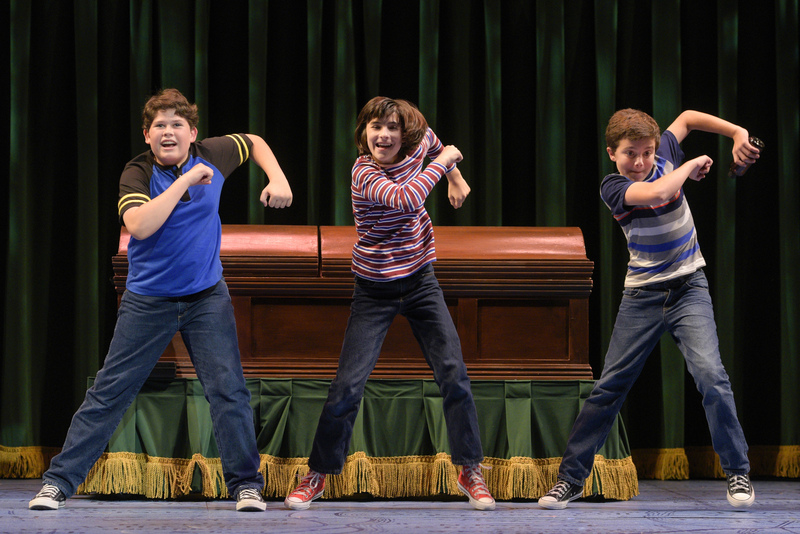 Fun Home has won several awards including Lucille Lortel Award, Outer Critics Circle Award, Obie, Award, and New York Drama Critics’ Circle Award and has garnered five Tony Awards including “Best Musical”. While prejudice remains as a dark and ugly presence in the world today, Fun Home helps us see the costs that societies, families and generations bear due to hidden and overt biases. Born in 1930s, a husband and father, Bruce Bechdel (James Lloyd Reynolds) lives a closeted life. A caring husband and father, Bruce hides a big secret that diminishes his accomplishments, at least in his own mind. He channels his frustration into an obsession with cleanliness, obsession with dressing his daughter in girlie attire and looking for secret avenues to fulfill his desire. He has built a beautiful family with his wife, Helen Bechdel (Crissy Guerrero), his sons, Christian (Jack Barrett, Dylan Kento Curtis), John (Billy Hutton, Oliver Copaken Yellin), and his daughter Alison. The play mainly centers on his relationship with his daughter, Alison. Moira Stone (as narrator Alison), Lila Gold (as young Alison), and Erin Kommor (as older Alison) are all super fabulous in their roles and vividly bring out the complex father-daughter dynamics at various stages in the story. When Alison grows up and goes away to college, she meets Joan (Ayelet Firstenberg) and experiences love’s first stirrings. Terrified and excited, Alison tries to quosh the feelings at first and later explores them and comes out as a lesbian. Special kudos to scenic designer, Andrea Bechert, fabulous stage manager, Randall K. Lum and assistant stage manager, Emily Anderson Wolf for beautiful staging and scenes. Robert Kelley is a brilliant director and in Fun Home, the story of impact of prejudice is brilliantly told. Somewhere between the father who felt compelled to live a lie his whole life, and a daughter who finds the environment and courage to seek fulfillment on her own terms, lie the simple truths about both the suffering and cost of having to hide who you truly are, and the joy of embracing your whole self. Great kudos to Alison Bechdel for embracing her whole self and finding to courage to share the story. It was Lisa Kron who was an early fan of the story and with Bechdel’s blessing, teamed up with composer Jeanine Tesori and adapted the graphic novel for the stage, as a musical. In blending this beautiful human story told through pictures with stirring lyrics, the trio has carved a straight path to the human heart. This is a not-to-miss play of this theater season. Tickets are available at www.theatreworks.org . 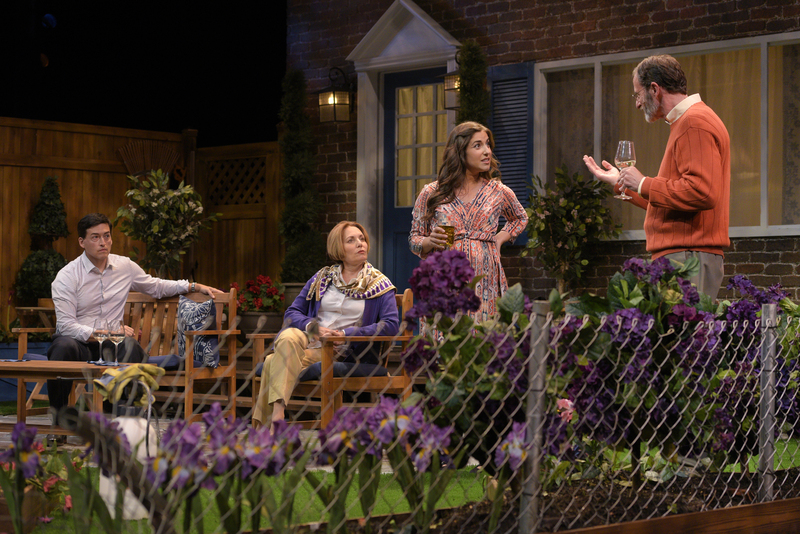 Playwright Karen Zacaria’s “Native Gardens”, currently playing at The Center for Performing Arts in Mountain View, explores ageism, racism, sexism, classism, republicanism, democratism and more in the context of an unintended property line conflict among neighbors. Tania (Marlene Martinez) and Pablo Del Valle (Michael Evans Lopez) are young, up and coming Latino couple, each with their own past that colors their perceptions. Pablo is from Chile and grew up with a silver spoon in his mouth. He is angling for a partnership at a law firm and is slightly paranoid of how he will be accepted, given his Latino background. Tania is very pregnant, is nearing the completion of her Ph.D. in anthropology, and grew up in much poorer circumstances in New Mexico. She is idealistic, new agee, strongly pro-environment, and into native plants. Tania and Pablo own a property adjoining Virginia (Amy Resnick) and Frank Butley (Jackson Davis). Virginia and Frank are older couple with a prize-worthy English garden and are Republicans. Well intentioned neighbors’ attempts for friendship soon melt away as an unintended property dispute arises. Given that garden is important to both couples, albeit in different ways, “Native Gardens” is a comedy rooted in tulipanin (common allergen toxic to some animals, found in tulips) laced barbs, and tannic acid (residing in acorns and leaves of oak trees that helps guard it from fungi and insects) colored retorts. Zacarias is a compassionate writer and she treats both couples with a measure of empathy, compassion and understanding. Yet, what is fascinating is how gradually and in a measured way and yet how quickly and not so subtly, the conflict escalates and breaks down relations, as both couples dig deep into their personal treasure trove of isms and even political affiliations, to assume bad intentions of others and find new insults. Director Amy Gonzalez has done a fabulous job, with the script in showing how easy it is, despite all the wisdom and maturity, for people to get polarized, to buy into the divisive rhetoric in the air that may reflect their own latent biases, prejudices and distrust of one another. Special kudos for incredible staging to Sara Sparks and Amy Smith Goodman. In the current climate of deepening rifts and many symbols of “us versus them” (border wall, trade barrier, cages, guns, armed guards in schools, red wave, blue wave and more), the play uses yet another powerful symbol of a fence. If this play is to serve as a microcosm of what is going on in the country, then such physical articulations not only define our distinctions but when combined with divisive rhetoric and incitement of fear, they serve as call to action, to fiercely protect our zones, perimeters, boundaries and borders. However in the play, as if bringing a perfect measure of hope, it highlights how sometimes humanity springs in the most unlikeliest of circumstances, during those times when we need one another. And in those times when we seek help and when we offer help, in times of unity, our gardens bloom. This is a not-to-miss play of this theater season. For tickets, go to www.theatreworks.org . The story of Mahabharat has been repeated among Indians, over and over in various ways, even via TV series. Why would you bring it on stage, and why say it again, and how could you say it better or do greater justice to one of the two major Sanskrit epics of ancient India, also known as the longest epic poem ever written? Therein lies the brilliance of Sujit Saraf who adapted it for the stage for NAATAK and is currently playing at Cubberley Theater in Palo Alto. The Mahabharat, believed to be written by Vyasa, is a narrative of the Kurukshetra war, a deadly war among cousins, sparked by greed and fueled by lies, cheating, deceit, turncoats, and perhaps misplaced assumptions of right and wrong, good and evil. With Mahabharat being recited several times in history, with details and stories added or deleted and with the epic employing “story within a story structure” known as framelets, it is a mind-bogglingly complex story to tell, described by Hermann Oldenberg as a “horrible chaos”. It is to great credit that NAATAK’s team, with director Saraf, producer Soumya Agastya, music director Nachiketa Yakkundi, choreographers, sets team and many volunteers and a huge cast of performers managed to bring this story on stage; not just to tell but in the form of the musical, with awesome dances and music, focusing on key dialogues and stories and with recreating the most impactful stories befitting the grandeur of the time, without overdoing any of it. Sticking to the core of the epic, NAATAK’s Mahabharat traces the story of Kaurava and Pandava from Brahma, the Hindu God of creation and through their earliest ancestors known to us (Yayati, Dushyant, Shakuntala, Ganga, Shantanu, Nishad, Chitraghandha, Veechitravirya, Dhritrashtra, Pandu, Kunti, Gandhari and more) and brings us to the center of their conflict. When Shantanu was seeking to marry Satyavati (whose father Nishad had misgivings since her sons would not inherit the throne) Shantanu’s first born son, Bhishma made a strongest vow known to humankind, to never have children, never marry and never inherit the throne. But his step mother Satyvati’s two sons Chitrangadha and Vichitravirya died leaving behind no issues. Satyvati then asked her illegitimate son Vyasa to father children with Vichitravirya’s widows, in order to get heirs for the throne. Thus were born blind, Dhritrashtra and weak and sickly, Pandu. Vyasa also fathered a son with a maid servant, Vidur. Dhritrashtra with his wife Gandhari, fathered 100 sons who came to be known as Kauravas. Pandu, with Kunti and Madri fathered 5 sons, who came to be known as Pandavas. In the greed and evil plots of the Kauravas, under the helm of the eldest brothers Duryodhan and Dushasan, and in their maternal uncle Shakuni’s evil machinations and in the gambling addiction of the righteous and truthful but incurable gambling addict, elder Pandava brother, Yudhishthir lies the seeds of the epic war in Bharat, which ended in Kali Yug. NAATAK’s Mahabharat takes us through all the main plots and sub plots, major twists and turns (Guru Dron asking Eklavya to cut his thumb and give it as Guru Dakshina so that no one can contest his disciple Arjun; Kaurava’s plot to kill the cousins after hosting them in a palace of flammable materials and how they managed to survive; Draupadi’s wedding to the most able warrior; Kunti asking all brothers to share whatever they had brought and thus Draupadi came to be shared between the 5 Pandava brothers; Pandava’s loss of everything in gambling and Yudhishsthir putting his wife on the line and losing her; Kaurava’s attempt to disrobe and humiliate her and Krishna coming to her rescue; Pandava’s 13 years of vanvas; Kaurava’s adamant refusal to give them the smallest piece of land; and the war that was as inevitable as it was extensive and drew in all the surrounding kingdoms. Arjuna had a moment of remorse and refuses to fight his brothers on the other side and received updesh in the form of Geeta, from his charioteer, Krishna. The bloodiest war of the time soon descended into dishonourable tactics on both sides (where Arjuna’s young son is sent into a Chakravyuh though he only knew his way in and not out; Bhisma is mortally wounded when Pandavas use his principle to not pick up weapons against a woman and send in Shikhandi who is half woman, half man — all this and more). Bhima the strongest of the five Pandavas killed all 100 Kaurava brothers that evoked heart-rending cries of soulful mourning, followed by a curse, from Gandhari, the grief-stricken mother. Mahabharat is overwhelmingly a story of men with women existing on the periphery; (consider the fact that among 100 Kaurava sons, there is no mention of a daughter) in tracing the entire ancestry, daughters are rarely mentioned. But it is women who experience and display raw emotions other than anger. It is Gandhari whose soulful tears at the loss of all her sons pierce one’s heart; it is Draupadi who suffers the humiliation in open court of men when her husband loses her in gambling; and it is Kunti who dutifully gives up her life in the palace to follow her husband to live in the forest. In Mahabharat, NAATAK takes the audience through this spellbinding journey. With excellent staging, sound and awesome performance, it transports the audience to another era and retains the spell to the very end. In fact, the dialog at the end is most amazingly brilliant, distilling the essence of this epic event, a dark time brought by flawed humans and a tale of cruelty and sadness, thwarted ambition and greed, amidst small acts of courage and kindness. I loved the fact that this gripping tale is not told yet again from a traditional, routine, religious perspective but from the perspective of a historical event, values of the time, moral subtlety and ambiguity and human flaws. This incredible performance by NAATAK above all speaks to incredible and undisputed brilliance of Sujit Saraf. I haven’t seen but I have heard that during the airing of the TV series, some people were inspired to perform pujas and garland the TV before airing of each episode. NAATAK’s performance will likely inspire the audience to find entertainment and perhaps engage in quiet reflection about values, principles, and moral code of ethics. This is a not-to-miss show of this theater season in the bay area. It retains the original flavor with Hindi dialogues but English supertitles are projected on the screen above. Tickets can be obtained at www.naatak.org . “We hold these truths to be self-evident, that all men are created equal, that they are endowed by their Creator with certain unalienable Rights, that among these are Life, Liberty and the pursuit of Happiness”. These awe-inspiring words are among the first words in the Declaration of Independence, in the United States Constitution. From time to time, people violate established laws that are grounded in these basic truths we accepted to hold and abide by. But it is WHEN the United States Government looks at its own people and sees the enemy, precisely when it is hardest to defend our bedrock principles and democratic values, it is then that the most courageous among us stand up and lead the way. In “Hold These Truths,” playwright Jeanne Sakata brings to the forefront, the story of Gordon Hirabayashi (Joel de la Fuente), a young Japanese-American man, who stood up as a one man army to defend the bedrock principles of American democracy, against our very own government’s onslaught on them, after the Pearl Harbor attack, during World War II. When he noticed that amidst unfounded fear and hate towards the Japanese, instead of defending American citizens under attack, the Government issued an executive order demanding mass incarceration of all people of Japanese heritage on the West Coast, he challenged the ruling. After taking an impromptu decision to violate the curfew, Hirabayashi turned himself in and declared his intention to violate the exclusion order, challenging the very constitutionality of government actions. His challenge to the system caused many headaches for the system and was followed with years of court battles and even some soul searching moments on behalf of the vehement defenders of the constitution like ACLU and other organizations. 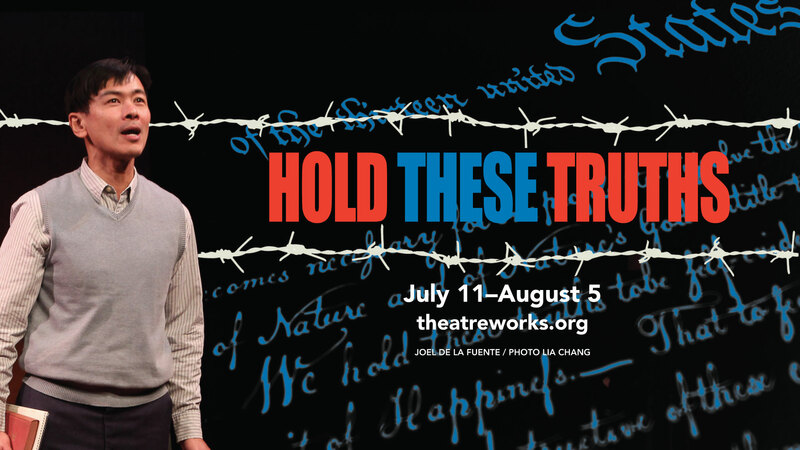 Directed by Lisa Rothe, this is a masterpiece that has come on stage at theatreworks, at this juncture in history, when we most need these lessons in courage. Joel de la Fuente is absolutely awesome, in this solo performance. Tickets are available at www.theatreworks.org for this not-to-miss performance of this theater season. Some additional information: In 2012, Hirabayashi was awarded Presidential Medal of Freedom by Mr. Obama. Other citizens had also defied the order. Among them was Fred Korematsu who had also challenged the executive order for eviction and internment. Justice John Roberts finally gave unequivocal opinion in 2018, repudiating former government action against him and noted in his opinion, “Korematsu was gravely wronged”. The irony is that the same Supreme Court upheld Trump’s travel ban on mostly Muslim-majority countries. Hirabayashi ruling regarding his disobedience of the curfew also continues to serve as legal precedent. This performance couldn’t be better timed. Many Americans are concerned that currently America is not living up to its ideals and in separating parents seeking asylum from their children, and in instituting travel ban of mostly Muslim countries, American government is violating the spirit of some of the most potent and consequential words noted in the constitution, indeed in American history, about self evident truths and unalienable rights. If history is any guide to the future, it will take immense courage to show up, speak up, and resist, so that we may continue to hold close and be guided by these truths. Tickets for this not-to-miss performance are available at www.theatreworks.org . 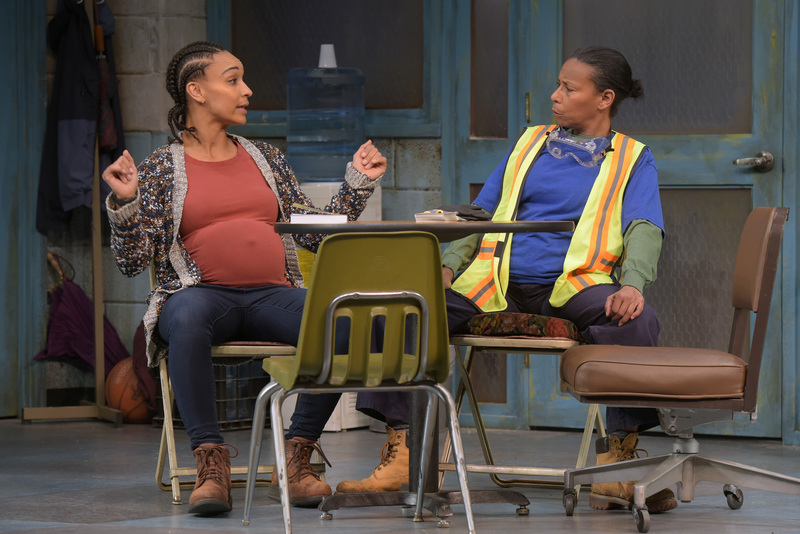 “Skeleton Crew” by playwright Dominique Morisseau, currently playing at Lucie Stern Theater in Palo Alto is a joint venture between Mountain View’s TheatreWorks Center for Performing Arts and Mill Valley’s Marin Theatre Company. Directed by Jade King Carroll, the play is set in in 2008, in the break room of an auto manufacturing plant in Detroit. By then Detroit had already begun the deep slide into the recession and as the play opens we can sense palpable tension among the employees, surrounding the possible but yet unannounced plant closure. We often hear about the statistics of a major economic downturn, for instance, between 2007 and 2009, Michigan lost over 30,000 auto jobs and lost over 700,000 of its population (due to move and other factors), and between 2003 and 2009, Michigan’s GDP shrunk dramatically and its private sector unemployment declined by over 13%. However, it is not often that we get to reflect on the massive human impact of such dramatic economic downturn, where ordinary people taking pride in their ordinary everyday jobs, experience homelessness, or consider walking around with guns for protection as crime spikes, or are walking around stressed out because of the impending uncertainty. Leslie Martinson deserves great kudos for finest cast of characters, who all happen to be black, reflecting the reality on ground in Detroit.. Faye (Margo Hall) has worked at the plant for 29 years. She ignores her own troubles as she generously goes around fighting on behalf of her coworkers, even as she feels deep empathy for the plant manager. The plant manager Reggie (Lance Gardner) walks a fine line between towing the company line on behalf of the management, while feeling responsible for the impact of ongoing uncertainty on the lives of the employees, with many of whom he has strong bonds. Dez (Christian Thompson) is a volatile young man, suspicious of the motives of the management and afraid of the increase in crime in his neighborhood. 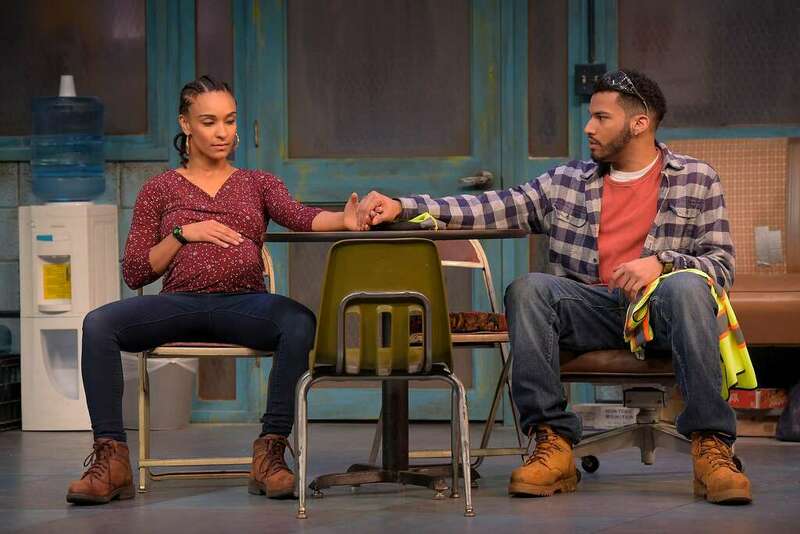 Shanita (Tristan Cunningham) is a pregnant young mother who has a cutting sense of humor and takes enormous pride in “building something meaningful”. She just can’t afford to lose the benefits as her baby is due to arrive any day. These are people whose lives will likely be wrecked and in the play, we get a window into just that short period when they are trying to ignore the stress of uncertainty, going about doing their jobs, arguing about who stole the food, jovially pulling each other’s legs and the impending chaos that will soon hurtle them from camaraderie and collegial support into homelessness, sleeping on the couch, and all the related impact of stress on their families. The management can lessen the human impact by announcing the plant closure earlier to give people opportunities to plan. However, management has their own selfish motives to keep it a secret. The uncertainty erodes trust among the employees and between the employees and the plant manager; also leads to theft by someone presumed to be a disgruntled employee and there are rumors of someone bringing a gun to work. In the midst of all the chaos and uncertainty, people still manage to find strength to survive, to be there for one another, to speak up for each other and ultimately to sacrifice their own comfort and happiness for a colleague they cared for. At its heart, this is a heart-rending human story that is lived again and again; made even more relevant during the current turbulent times when the gulf between the haves and the have-nots is not only widening but with total ignorance of the top tier to listen to their plight and offer real solutions, it is likely to widen even more, and there will likely be more people living through these tragic experiences. This is a not-to-miss play of this theater season in the bay area, and will be running till April 1, 2018 at Lucie Stern Theater in Palo Alto. Tickets will be available at www.theatreworks.org . Currently Bay Area’s naatak company is presenting its 59th production at Cubberley Theater in Palo Alto. This production is naatak’s annual “mela”, a sort of theater fair. There are five short plays in five Indian languages; Marathi, Tamil, Gujarati, Bengali, Hindi and Improv comedy in Hinglish. English subtitles are projected for each short play above the stage. This is an absolutely beautiful way to showcase and enjoy India’s rich linguistic and cultural heritage. After a span of 21 years, naatak can proudly claim to have broughts 55 world class plays on stage. Over 850 performers have participated in these productions and 60,000+ attendees have enjoyed these shows. The script for Marathi play is written by Anil Sonar. It is produced by Adwait Joshi and brilliant direction is provided by Anannya Joshi. A madman precariously positioned on the ledge of a fifth floor window is being watched by the crowd below. Some have deep concern and others don’t want to miss the excitement and yet some others are waiting with anticipation to the gruesome climax of the show with the madman jumping to his death. But what is this man up there? What is his story? Directed by Sudipta Chatterjee and produced by Deepika Sriraman, and based on “He Said, She Said” by Alice Gerstenberg, this Bengali play is translated and adapted by Sudipta Chatterjee and Harish Agastya. This short play focuses on the favorite Indian pass time, “gossip”. Casting is beautiful. A woman shares some juicy gossip about a romantic dalliance involving some friends. So interesting is a role played by gossip specially of romantic nature, in Indian culture, that targets of such gossip are often compromised and vilified so strongly that they can’t just let it go but instead feel compelled to justify, defend and give excuses. Will the gossipy woman have finally met her match in the strong woman targeted by the gossip? Naatak organization has matured so phenomenally that it can boldly brag to present improv comedy that is spontaneous and creative. In this short segment directed by Neha Goyal and Abhay Paranjape, a brilliant cast of characters perform improv games based on audience suggestions. Based on “A Florentine Tragedy”, a never completed play by Oscar Wilde, this play is set in 1930s during the Chola period, whereby a silk merchant confronts his beautiful wife and her royal lover. Will the play have an ending that befits the crime? Tamil speaking audience members are likely to greatly enjoy Kalapathy Sundaram’s brilliant translation. The projected English subtitles give some clue but it is hard to fully enjoy Wildesque witticisms in fast projected subtitles. Directed by Soumya Agastya and produced by Archana Kamath, this short play could well be Tamil speaking literature lovers’ treat. Based on “The Open Window” by Saki (H H Munro) and adapted for the stage by Mugdha Kulkarni, is also directed by Mugdha Kulkarni and produced by Chaitanya Godsay. This is a mystery about a missing husband, where an open living room window comes to play a significant role. The fear experienced by a young visitor is palpable and imaginative description of the lost man gives no clue to his disappearance until…………. Well, you’ll have to see it. Based on Saadat Hasan Manto’s play, “Aao baat suno” this short play is adapted by Paresh Vyas and Vikas Dhurka and is directed by Natraj Kumar and produced by Devika Ashok. A lazy Sunday is transformed gradually into a comedy of errors, err…. into a comedy of errands. O M G — it is hilarious and also features the best dialogue, “Et tu brute” errr…. “Et tu Rajesh”. For tickets to Naatak’s 59th Mela production, go to www.naatak.com .But hurry. There are only 2 more shows and tickets are selling out fast. .Naatak Improv, @NAATAK, A Tragedy in Kanchi, Abhay Paranjape, Adwait Joshi, Alice Gerstenberg, Anannya Joshi, Anil Sonar, Archana Kamath, “A Florentine Tragedy”, “Aao baat suno”, “Everyone loves an errand boy”, “He Said, “The Open Window”, “The Window”, पाचव्या मजल्यावरचा वेडा, Bengali, Chaitanya Godsay, Cubberley Theater, Deepika Sriraman, Devika Ashok, Gujarati, Harish Agastya, Hindi, Hinglish, Kalapathy Sundaram, Marathi, Mela, Mugdha Kulkarni, Natraj Kumar, Neha Goyal, Oscar Wilde, Palo Alto, Paresh Vyas, Play Review, Saadat Hasan Manto, Saki (H H Munro), She Said”, Soumya Agastya, Sudipta Chatterjee, Tamil, The Mad Man On the Fifth Floor, Vikas Dhurka, What will people say, www.naatak.com .